Only Rolls-Royce could sell a car at a wine festival. Revealed last year at a prestigious event in London, the has certainly made a lasting impression. As you'd expect, the eighth-generation Phantom is essentially a luxury yacht on wheels, and while the design isn’t drastically different to its predecessor, it rides on the automaker’s new aluminum spaceframe dubbed the "Architecture of Luxury," which will underpin all future Rolls-Royce cars. The first 2018 Rolls-Royce Phantom ever produced has now been sold at an auction for a hefty premium. This wasn’t your standard auto auction, either: the luxury limo was sold at the Naples Winter Wine Auction befitting the brand’s lavish image. Jon Mason and his wife Bonnie from Dover Ohio are now the proud owners of the first eighth-generation Rolls-Royce Phantom after putting in a a winning bid of $780,000. That’s a hefty premium over the base price, which is estimated to be between $450,000 and $500,000. 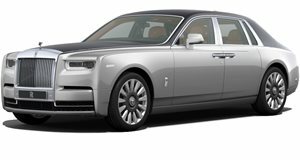 To sweeten the deal, the first Phantom also includes a selection of wines from the Alpha Omega winery as well as the opportunity to participate as a judge in the 2019 ROBB Report Car of the Year Event. All proceeds from the auction will support the Naples Children & Education Foundation, which supports more than 60 non-profit agencies in Collier County, Florida, benefiting more than 200,000 children. It may seem extortionate, but it’s still comparatively cheaper than other first production models like the 2019 Chevrolet Corvette ZR1 which recently sold for nearly $1 million. Purple accents help distinguish the special model along with a plaque that reads “The First Phantom – Reserved for Naples Winter Wine Festival 2018.” As standard, the eighth-generation Phantom is equipped with 22-inch wheels and laser headlights that cast light up to 600 meters in front of the car. It also features the “largest single-piece of hand-polished stainless steel on any motor car.” Power is provided by a twin-turbo 6.75-liter V12 engine that produces 563 hp and 663 lb-ft of torque. Not that we expect most owners to drive it – they’ll have a chauffeur to do that while they relax inside the opulent cabin, which features two 12.3-inch displays, an analogue clock, and handcrafted wood trim.